Morning romance. Don’t be shy and try on this marvelous white ruffle one-shoulder dress for your next Summer party. We see black stripes on ruffled detail that makes the whole style look very special. This year can be considered to be the year of the one-shoulder trend. I tell you honestly, this look is simply breathtaking. Why is it so popular lately? It has its peak moment right now, so you better jazz up your look and give this trend a try. I love the way how it adds structure to its wearer by making her visually longer and leaner. I personally consider this trend to be extremely sophisticated and glamour. 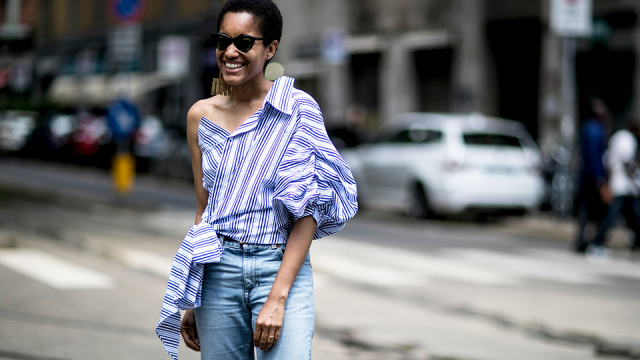 Below are gathered some of the best street style images of women rocking one-shoulder trend. Have fun with one-shoulder pinstripe shirt tucked in blue jeans.